I’ve said before that the Swiss may be neutral, but they are most definitely prepared. For example, all buildings built after 1945 (including our apartment) have nuclear fallout bomb shelters. It really all comes out of their World War II experience. This idea all came together for me during a tour of a glass-blowing factory in Hergiswil called, creatively, Glasi Hergiswil. 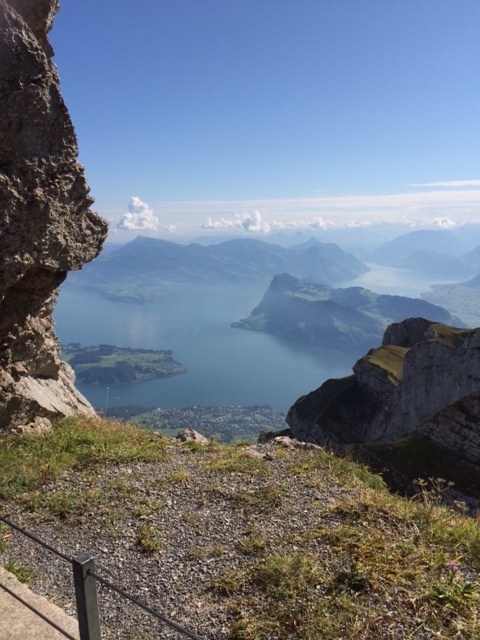 Glasi Hergiswil was founded in 1817 on the coast of Lake Lucerne by Mount Pilatus. The view off the top of Mt. Pilatus. I suffered through an automated tour that led the group I was in through a darkened maze that used a series of timed lights as breadcrumbs until we reached a deck overlooking a team of glass blowers. There was one bit of information the disembodied tour voice shared that stood out as being somewhat incongruous. It was how at the beginning of WWII Switzerland sent their troops to the borders, particularly the Jura border with the France, and prepared to seal them off. What does that have to do with glass-blowing, I thought. After a couple more rooms went by, the voice told us that in response to the threat of isolation and severely curtained trade the glass factory began to produce only glass canning and preserve jars. Huge preserving jars that were about 2- to 3-liters were produced 24 hours/day, 7 days/week so that the people would be able to can and preserve all the food they possibly could for the coming war. Switzerland is a small and mountainous country. It has proved hard to invade, but it did play host to the Romans for quite some time. There is not an abundance of tillable land. Here we produce primarily cheese, milk, eggs, and some meat. We depend heavily on our neighbors for wheat, corn, cooking oils, petrol, and minerals. Consequently, these items and things that used them, like bread, were heavily rationed during the war. In fact, just like in England bread was baked and then, by law, not sold until the next day when it was a little stale. A harder bread could be sliced thinner and go further. If it got too hard you simply made a fondue, dipped it in the melted cheese, and declared it a delicacy that others only wished they could have. In 1939, just as the war started, the Swiss government passed a resolution to increase agricultural production. The “Wahlen Plan” encouraged gardeners and farmers to plant wheat, potatoes, and other vegetables. Every space that could support a garden was tilled and planted. Those gardens and the compulsion to garden still exist. You can see them right next to the train tracks, at the foothills of mountains, and right outside of the city limits. In fact, right inside the city limits. Many cities still support goat herds! This self-sufficiency is still an important concept. You can feel it in the grocery stores and the open air markets. Products are clearly labeled with Swiss flags and Swiss crosses or with the name of the country they came from. I just bought some blueberries that included Spain in the title label. There is a mild, but ever present pressure to buy things produced in Switzerland. In some cases you don’t have a choice. If you want a banana it’s coming across the ocean and over land on a train. In the cases of cheese, tomatoes, meat, and even red peppers you will find a stamp the size of a quarter proclaiming its natural and exemplary origins in Switzerland. This encouragement comes from everything the people of Switzerland experienced during WWII. It’s a encouragement fed by patriotic and national security committees to buy Swiss so that the demand is there to ensure a supply. I don’t want to give you the impression that there are banners and propaganda posters everywhere telling you to buy Swiss for national pride. It’s very low-key. It’s just a way of going, handily helped along by the general world-wide Localvore movement. We used to feel the same way in the United States about buying USA Made products and foods. But some where along the line looking at Where Things are Made fell off the list and got replaced on the priorities list by Lowest Price. And I can see that creeping in here. Already here people do drive to France or Germany to buy certain things or shop for groceries because prices are so much lower in the Euro zone. It makes me wonder how long it will be before the people of Switzerland forget about the quest to be neutral, but prepared and wholeheartedly take up the quest to save a Franc.